Benvenuto in 1890 — home of Simeon Henan Janes and later, Sir William Mackenzie, on the hill above Davenport Road, on the west side of Avenue Road. Gazing south on Avenue Road from Edmund Road (south of St. Clair Avenue West) in 1910. The large stone retaining wall, on the west side of the steep hill (right-hand side of photo), is one of the few traces that remain of the great estate named Benvenuto. When paving Avenue Road and constructing the streetcar tracks, the road was cut into the side of the hill to reduce the incline. In the far distance, the clock tower of the Old City Hall is visible. The steep hill on the north side of Davenport Road played a major role in the development of Toronto. The prominent landform was created after the ancient Lake Iroquois receded. 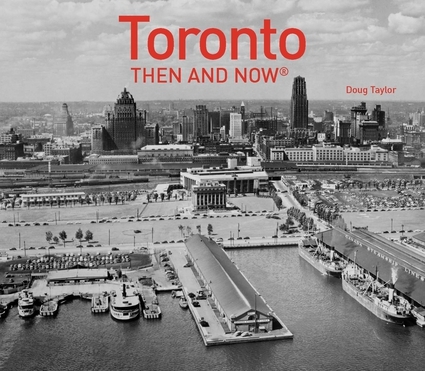 Until that time, the land south of the Davenport Road was under water, including all of downtown Toronto. As the lake level dropped, its former shoreline loomed high over the old lake bed below. When the early settlers arrived in York (Toronto), the enormous hill created a barrier to northern expansion. Before roads were cut into the hill to reduce its steep incline, climbing it on foot or horseback was exceedingly difficult. In the 1790s, it was daunting task for Lieutenant Governor Simcoe’s troops to built Yonge Street up over the hill to create a military supply route. During the years ahead, other roadways ascended the hill, Avenue Road being one of them. Simeon Henan Janes was among the first men to build a home on the heights, with their commanding view of the city below. Janes was a prosperous real estate developer, who purchased land and built many magnificent brick homes that still exist today in the Annex District of the city. Living in a mansion on Jarvis Street, which in the 1880s was a wealthy residential area, he was desirous of building an even grander home. To fulfill his dream, he purchased a large piece of land on the hill overlooking Davenport Road, on the west side of Avenue Road. Today, the site would be at the southwest corner of Avenue Road and Edmund Road. The property overlooked the city below, and possessed a commanding view of the lakefront and the waters of Lake Ontario. Janes intended that his a home would reflect his great wealth. Construction commenced in 1888, its architect being an American — A. Page Brown. He named it “Benvenuto,” the Italian word meaning “welcome.” However, because Brown relocated his firm from New York to San Francisco, the designs were actually assigned to Frank L. Ellingwood. The walls of Benvenuto and the two towers on its south side, were built of huge blocks of rough limestone, quarried at Kingston. The roof consisted of red terracotta tiles. Because of the difficulty of heating the house during Canada’s severe winters, the windows were small within the massive walls. Most of them were rectangular, although those in the west tower and the two windows on the ground floor, to the left of the east tower, were topped by round Roman arches in the Romanesque Revival style of architecture. Indeed, in many ways, the heavy fortress-like appearance of the structure reflected the Romanesque Revival style. The same type of stone employed for constructing the house was used for the retaining wall that faced Avenue Road, on the east side of the estate. In most grand houses in the 1880s and 1890s, the entrance hall was where people were greeted, and thus, it was an important space, since it was where guests received their first impressions of their hosts. In Benvenuto, the hall featured a fireplace, as it was built in the days prior to central heating. It was also a place to allow visitors to warm themselves on cold winter days and evenings. The hall displayed several large pieces of art, and the grand staircase was accessed from the hall. The staircase possessed a landing that showcased more of the family’s art. The dining room and parlour were entered from the hall; their doorways had sliding doors and heavy draperies, such features necessary to control chilly draughts. In 1897, Benvenuto was sold to Sir William Mackenzie, a railway contractor, who was knighted on January 1, 1911 for his contribution in developing western Canada. In 1914, Mackenzie commissioned the architects Darling and Pearson to design a service wing on the east side of the mansion. The Mackenzie family was prominent in Toronto’s social scene and entertained lavishly at their new home. Invitations to their garden parties, music evenings, and costume parties were highly prized. When Mackenzie died in 1924, rising property taxes and inflationary real estate prices meant that the house became too costly to maintain as a private residence. As the number of homes built above the Davenport Road hill increased, more streets were constructed. Edmund Avenue was cut through the Benvenuto estate, separating the estate’s out-buildings from the main house. In 1926, land from the Mackenzie property was sold and became the site of an apartment building, its address 400 Avenue Road. The following year, another apartment building was constructed on the southwest corner of Edmund and Avenue Roads, its postal address 398 Avenue Road. Both these buildings remain today and are considered prestigious addresses. Eventually, Benvenuto was vacant and lacking the size and charm of residences such as Casa Loma and Oaklands (on the east side of Avenue Road), it was demolished in 1932. I do not remember Benvenuto as it disappeared before I was born. However, when travelling on the Bay streetcars on Avenue Road in the 1940s, I saw the stone retaining wall on the west side of the hill that descended towards Davenport Road. I never realized that they had been a part of a grand estate. Fortunately, these wall remain today. Gazing south across the city from Benvenuto in 1890. Toronto had not yet extended up the hill at Avenue Road, which can be seen in the photo. The street is not paved and there is no streetcar line. Toronto Public Library, r- 2040. The grand entrance hall of Benvenuto in 1890, with its rich panelling, impressive fireplace, and the some of the family’s art collection. Toronto Public Library, r- 4749. Dining room in 1890, Toronto Public Library, r- 2079. The drawing room (parlour) of the home in 1890. Perhaps this photo best illustrates the extreme wealth of the Janes’ family. Toronto Public Library, r- 4753. Benvenuto in 1910, taken the same year as the photo of the streetcar ascending the hill on Avenue Road. The above picture depicts the south and west facades of the mansion. Toronto Archives, Fonds 1244, Item 0328. Noel Marshall and women in the gardens of Benvenuto c. 1910. Toronto Archives, Fonds 1244, Item 1046. Horse and buggy on the hill on Avenue Road in 1910, the streetcar tracks evident. Toronto Archives, Fonds 1231, Item 1294. Gates at entrance to Benvenuto in 1910. Toronto Archives, Fonds 1234, Item 0319. View from Benvenuto, looking south over the city c. 1930. In the far distance can be seen the Royal York Hotel on Front Street and the Bank of Commerce (CIBC) on King Street West. The east side of Benvenuto is in the foreground. Toronto Archives, Fonds 1244, Item 10006. Gazing south on Avenue Road in 1960. The land required for the widening the roadway was taken from the east side, from the grounds of Del La Salle College. Toronto Archives, S 0065, file 10034, id 0001. Gazing south on Avenue Road at the retaining wall on the west side of the avenue. The wall is south of St. Clair Avenue, the photo taken in October, 2016. The wall was constructed by Simeon Janes, and similar stone blocks, quarried in Kingston, Ontario, were employed to build Benvenuto. Gazing north on Avenue Road toward St. Clair Avenue. This section of the wall is north of Edmund Avenue. In Simeon Janes’ day, the wall extended continuously, but a portion of it was demolished when Edmund Road was cut through the estate. Photo taken October 14, 2016. The apartment building at 400 Avenue Road that was constructed in 1926 on the Benvenuto Estate. Photo depicts the south facade of the apartment, on Edmund Road in October 2016. Oaklands mansion, built in 1860 for John Macdonald, a wholesale goods merchant. This estate was a neighbour of Benvenuto, on the crest of the hill on the east side of Avenue Road. It is today a part of De La Salle College. Photo taken October 2016.